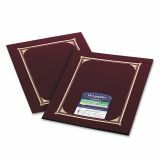 Geographics Certificate/Document Cover, 12 1/2 x 9 3/4, Burgundy, 6/Pack - Present award certificates in this appropriately distinctive certificate document cover with gold foil embossed trim. Each linen cover holds 11 x 8-1/2", 10" x 8" or A4-size documents, photos and certificates. Slip the full-size certificate into the die-cut slots to create an award. Regal border design is gold foil-stamped on 80 lb. linen stock." 8" x 10" A4 8.25" x 11.75" Letter 8.50" x 11"